...is due October 5th, 2008. From my previous posts and my widgets, you've probably gathered by now that I have a two year old son and that we're expecting our second child this fall. Tristan is an amazing child. I know that according to books on child development that he is, for the most part, right on track. Nothing spectacular about his learning or his speech, but I still think he's the smartest, the cutest, the brightest, and the best kid out there. Although, I think every mother thinks that about their own child. Now, since I ever first thought about having children I always wanted more than one - at some point I wanted a whole household of children (four to six). After having Tristan, I felt like how could I share my love with him and other children. Would I have enough love for all of them? Would my son, my precious baby, feel like he isn't getting loved enough when another child enters our lives? This thought frightened me and for a bit, I thought of just having him. But, then I thought, would his life be richer by sharing his love with his parents and his sibling(s)? Would he cherish being a big brother? Would he like a new companion to care for, look after, play with, and love? I believe Scott already knew we would have more than one child together and in my heart knew that this is what I wanted as well. We didn't want the two to be too far apart; but not too close together. We wanted Tristan to be at least two years old, no more than three years old, and potty trained (we're still working on that). We weren't actively trying to conceive, we kind of left it up to fate. Late in January, we found out that we were pregnant. We were very excited. Today I am exactly 12 weeks pregnant. My little baby is continually growing inside me while I get to experience all wonderful first trimester symptoms. Extreme fatigue hit me early on and is slowly waning. I take naps when Tristan is down on my days off. Morning sickness should be called all-day sickness. Some days its okay and bearable. Other days I'm just downright miserable. Smell sensitivity has made it even worse. I can hardly ever enter our kitchen, which has left Scott kitchen detail (and he hates doing dishes). While it is nice for me to get a break from doing the dishes, it sometimes makes me feel useless. Oh, and I'm already wearing maternity clothes! I'm already a plus size woman (on the low end of plus size), but my waistline has thickened and I just feel downright fat. Oh well. This ultrasound was done to see how far along I was. We thought I was due September 25th, but the based on the baby's measurements, I am actually due October 5th. 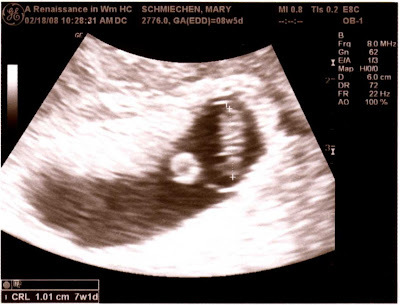 The circle is the yolk sac and to the right of it is the baby. Doesn't look like much. But it is evidence that there's a baby in there. This one was done as part of some test where they take some measurements and draw some blood. Anyway, I went in Thursday morning with a full bladder (as required of me) to have them poke around my belly with the ultrasound tool to see the baby. However, they did this for forty minutes. My bladder felt like exploding. I was very relieved when they finished. This picture shows how much the baby has grown in just one short month. There are actual noticeable part - like the head and the body. 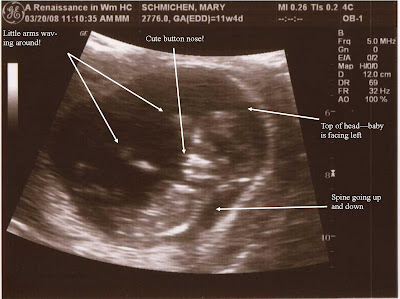 I scanned the photo and added labels for those that don't understand how to interpret an ultrasound. Well, that's been my baby story so far. Seeing as how I have 28 weeks to go, I'm sure I'll have plenty to share. Or perhaps I can discuss my previous birth story. Who knows? Depends on what I'm in the mood for. In the meantime, I'll go entertain my animal loving son.